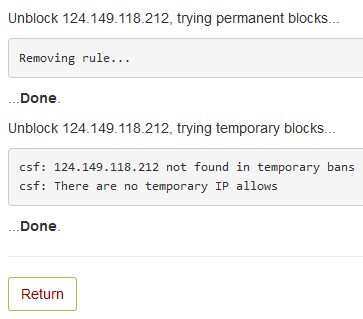 NOTE: If you're on a Managed VPS you won't have access to the WHM firewall by default. However, you can submit a support ticket and request access to it. If you can't determine exactly why the IP was blocked from the error code provided after hitting the Search for IP button, send that error page to us in a ticket and we'll be able to find the exact reason for you. How do I fix my Connection being blocked?